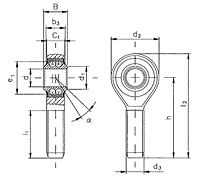 Antifriction bearing steel, hardened, raceway precision ground. 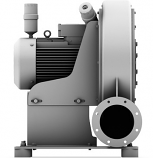 Made of case hardening steel, raceway hardened and precision ground. Barrel roller bearings made from through-hardened, antrifriction bearing steel. 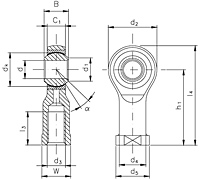 The rod ends are given initail lubrication. 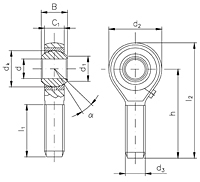 With these rod ends, it is important to ensure that the tilt angle specified in the table it not exceeded, either while mounting or during operation, otherwise the sealing washers may be damaged. 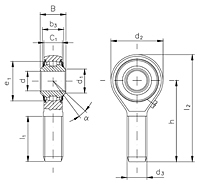 This is affected by the bearing load, the bearing clearance, the lubricant and heat output and input. The maximum permissible speed given in the tables applies for apurely radial load, normal bearing clearance tolerance, no external heat, an operating temperature which is not above the limit, and a low and absolutely shock-free load. Tilt - Angle 7 ?